As I’ve noted several times, the National Park Service was created in 1916 with this objective: “… to conserve the scenery and the natural and historic objects and the wild life therein and to provide for the enjoyment of the same in such manner and by such means as will leave them unimpaired for the enjoyment of future generations.” The tension is obvious: providing for enjoyment, while leaving the resources unimpaired. Even still, though, I am repeatedly impressed with what a wonderful job the Park Service does in balancing these seemingly irreconcilable objectives. 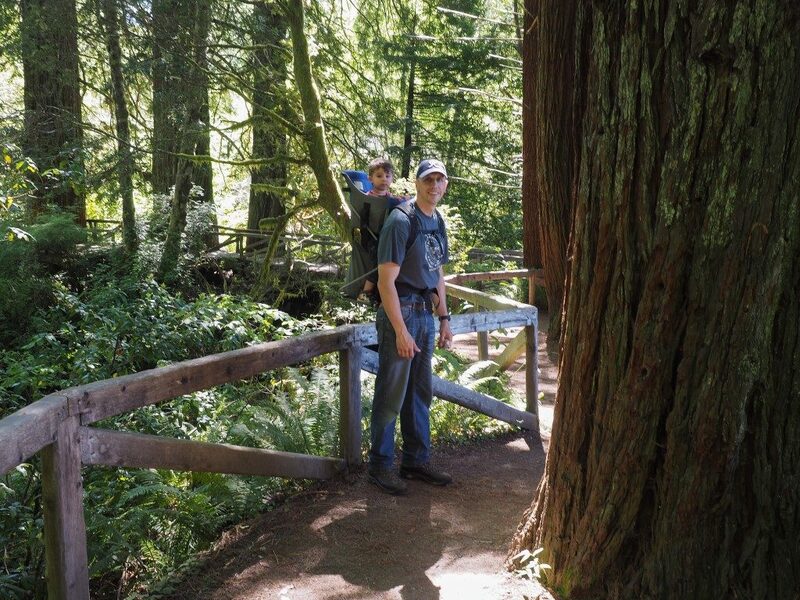 Our trip to Redwoods National Park is a perfect example. 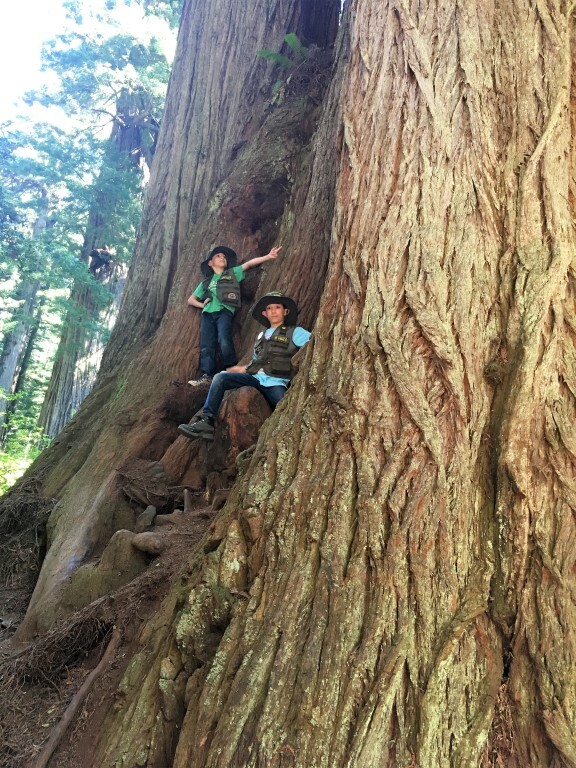 The Coastal Redwood trees, although not possessing the same volume nor living as long (“only” 1200-1800 years) as their cousins, the Giant Sequoias, are actually taller, reaching heights of 350 feet. Prior to the last ice age, their range extended as far south as Los Angeles, but now their range is limited to a sliver of coastline in northern California and southern Oregon. 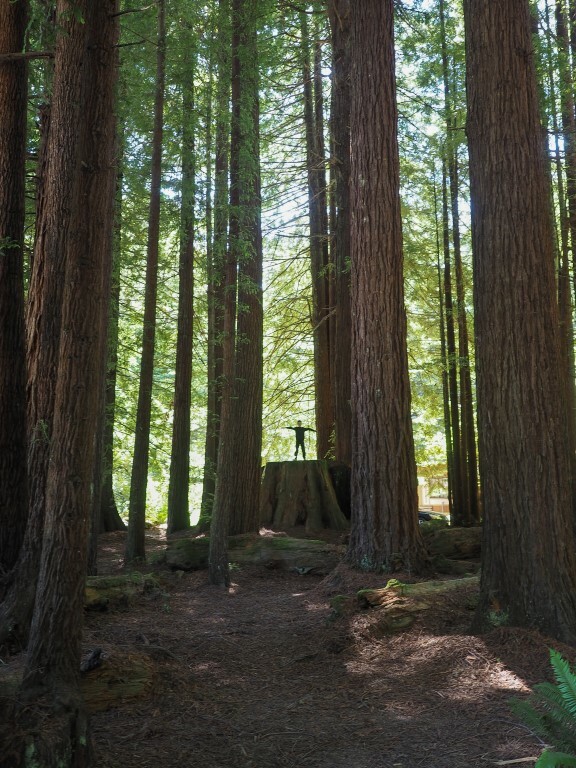 Over 95% of that range has been logged, meaning that only 5% of old growth redwood forest remains in its natural condition. 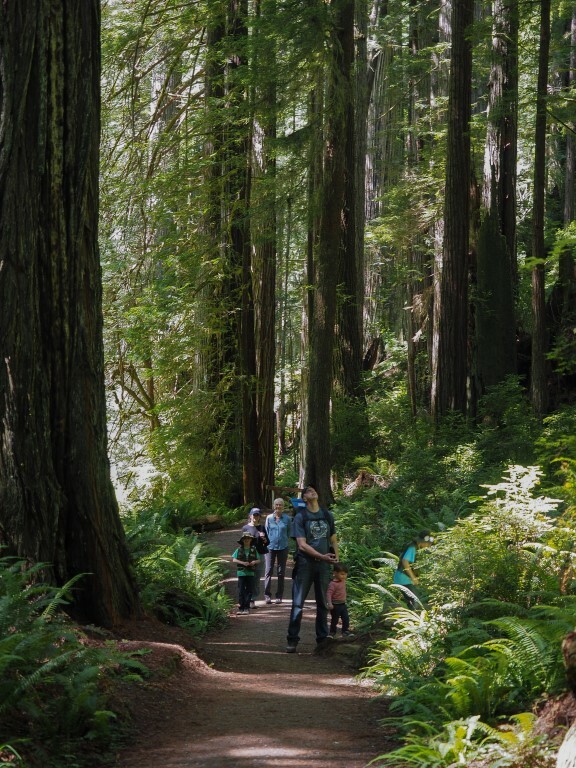 The state of California preserved much of that old growth area in three state parks, and in 1968 the federal government created Redwoods National Park to add to the area protected by the state. Which brings up the “enjoyment” side of the enjoyment-preservation balance. 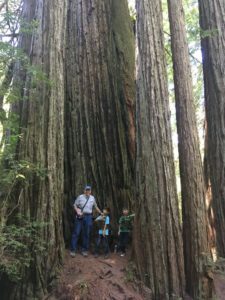 The Park Service has constructed the most wonderful series of trails and exhibits throughout the federal portions of the park areas. 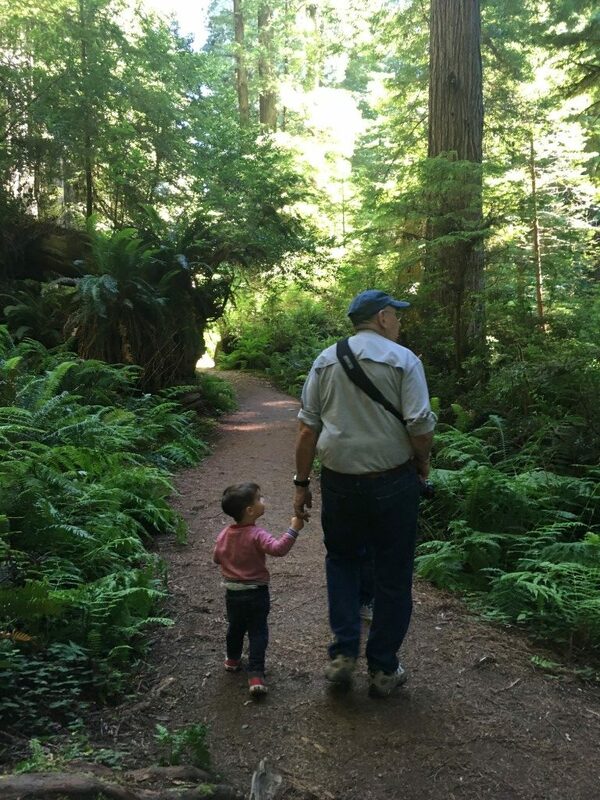 Although we only hiked for 1.2 miles of the trail system (there’s a limit to how far a little two-year-old can “hike”), the walk was truly memorable. Walking along the trail behind the Prairie Creek Visitor Center. As usual, even though the trail is directly behind the Visitors Center, and is only a mile long, we saw only one other family on the trail and basically had the whole forest to ourselves. For a while, Michael got to hitch a ride. 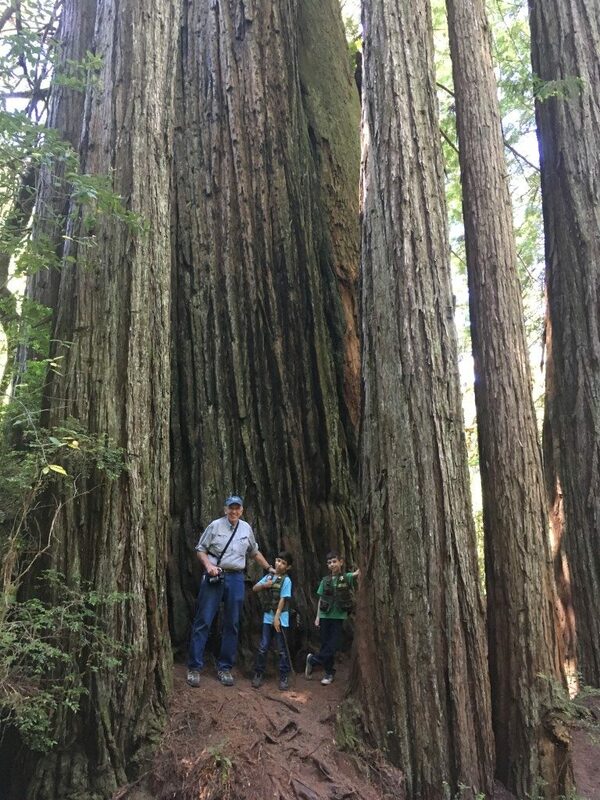 Junior Rangers making an impromptu survey of the redwood forest. 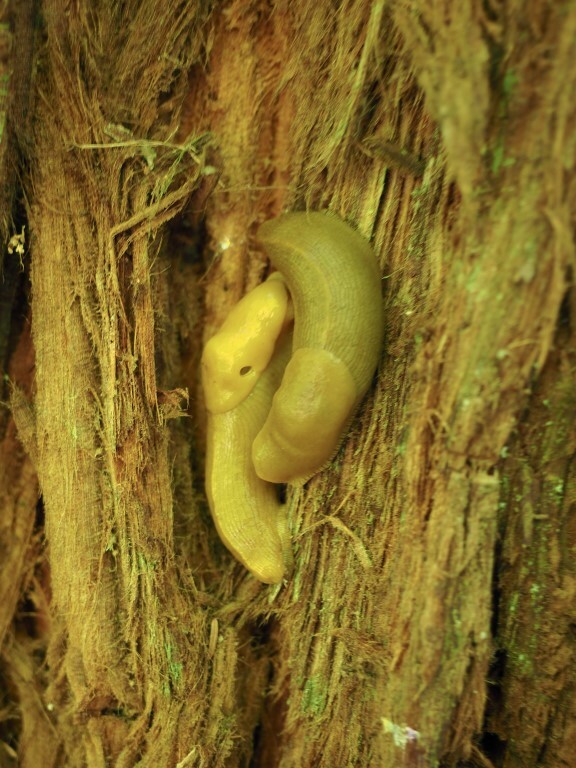 It’s hard to describe what nasty little things these are, although I must note that the Banana Slug is actually the school mascot for UC Santa Cruz. Only in California. And then, following the normal practice of both families, it was a lunchtime stop at a nearby picnic area. 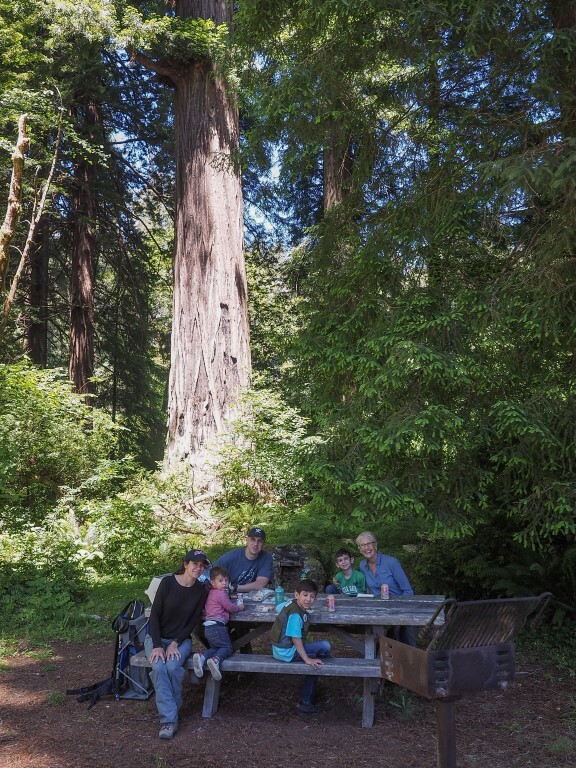 Hardly a typical picnic area, but it’s what the Park Service routinely provides to enhance visitors’ enjoyment of the area. The boys “discovered” this area while we were setting up (not that one can hide a grove of redwoods) and we wondered what it would take to get them out of here for the real point of the stop. As good as Crater Lake was, this stop was even better. And now it’s on to the Oregon coast. 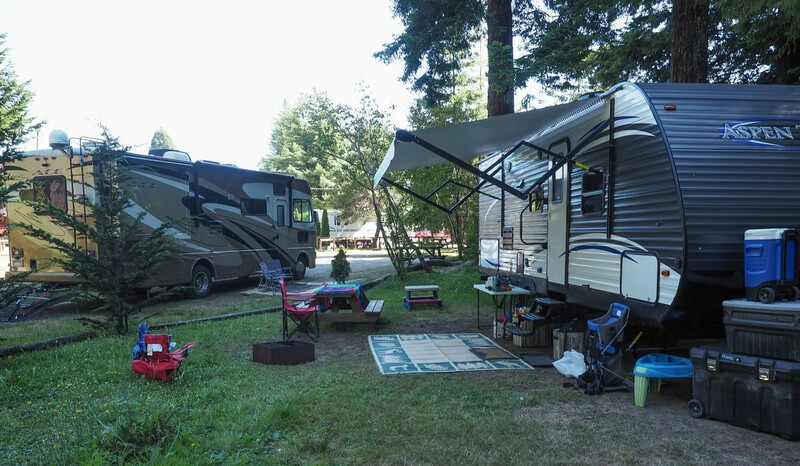 This entry was posted in Travels on July 4, 2018 by skiprd.